The rules for engagements and wedding etiquette change with each passing decade. After all, a new generation won’t always adhere to the customs and traditions their parents or grandparents diligently followed. This is particularly true of men’s wedding jewelry: the 20th century saw the rise of men’s wedding rings. 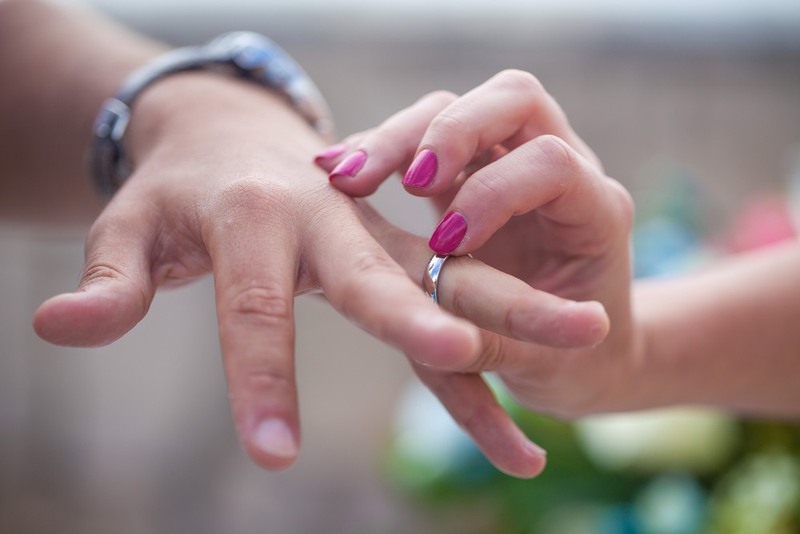 Now, the millennial generation is redefined the engagement ring tradition. Men are embracing the diamond engagement ring. It isn’t uncommon for women to propose marriage, either. Rules, traditions, and gender roles have evolved to a point of increasing fluidity. Yes, diamonds are a boy’s best friend, too! While Brilliance offers easy financing options, buyers must know their personal limits. If you need to finance the ring, find a comfortable figure that you can allocate per month without draining the bank. An engagement ring is an important investment, and choosing rings may also be a very emotional experience. If you don’t know your budget, you could end up making an emotional purchase that will be financially overwhelming. Before you begin shopping, make sure you know that he’s comfortable wearing an engagement ring. Some men embrace the experience, and others don’t. Is he planning to propose to you, as well? Or is he going to be the only one wearing a ring? Many couples exchange engagement rings, but this isn’t always the case. His personality and personal style should be a major influence on his ring design, just like your style would influence his choice of ring for you. Not every man wants a large diamond, and not every man wants a simple setting. Your choice to go extravagant with diamonds or to tone it down to a simple solitaire setting depends on your partner. Remember, you’re buying for him, not you. If he is a button-down consummate professional, select a more conservative style of ring. 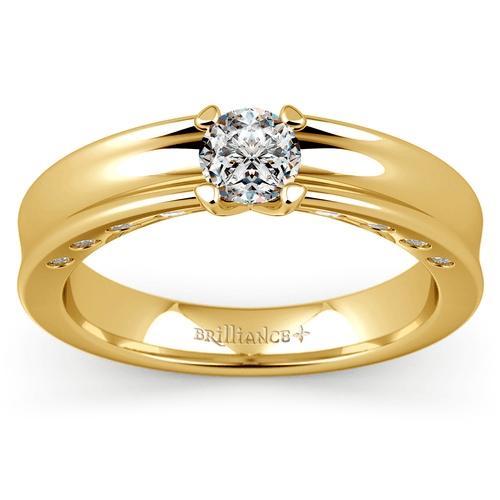 A simple solitaire on a gold band like the Hydra Diamond Mangagement™ Ring showcases his commitment with a nearly three-quarter carat round brilliant solitaire set in a yellow gold band. 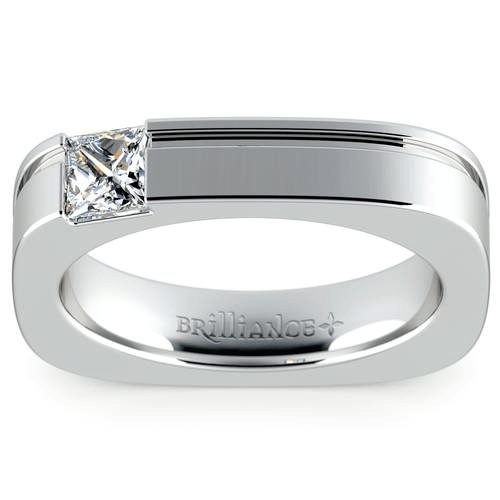 For a ring with a little extra interest—that still stays on the conservative side—choose a diamond solitaire that sits flush left on the band like the Achilles Princess Solitaire Mangagement men’s diamond engagement ring. 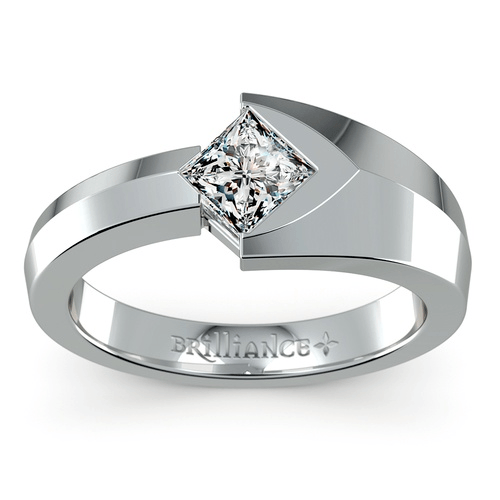 The Achilles ring also features a smaller diamond for understated sophistication. If he is more of a free spirit, be bold and present him with a men’s diamond engagement ring design that complements his strong character. The Trident Solitaire Mangagement ring features a nearly one-carat princess-cut diamond set within a tapered, half-bezel setting of white gold or platinum. Some men want full on diamond extravagance. Maybe he has always dreamed of donning a massive sparkling Super Bowl ring and wants something that rivals Tom Brady’s latest acquisition. The Eros Diamond Mangagement Ring is the biggest, boldest and most extravagant mangagement ring in the Mangagement Collection. Eros boasts a two-carat round brilliant diamond centerpiece surrounded by 36 pave white diamonds. Finding the right ring size is often the most difficult part of ring shopping. There are many ways to find out his ring size without giving away a surprise engagement, though. You may ask his mom or one of his friends (be sure, though, that they won’t spoil the surprise). Or you can secretly grab one of his old rings to use as your guide. When selecting an engagement ring, keep in mind that you also might need to find a matching wedding band to pair with his engagement ring. Often, a simple gold or platinum band works well against any men’s engagement ring. You may also discuss if his engagement ring will serve as both an engagement and wedding ring—some men prefer to wear just one ring. If you’re planning a surprise engagement for him, don’t ring shop at the last minute. Shop early and check shipping dates to make sure that perfect ring is delivered on time. Shopping early and planning ahead is imperative if you’re preparing for a holiday engagement—Valentine’s Day and Christmas are incredibly popular for proposals! The times—and traditions—change with every generation. Engagement rings know no gender. More women are taking the lead in marriage proposals, and mangagement rings show commitment with masculine Brilliance! Want to see women’s engagement rings? 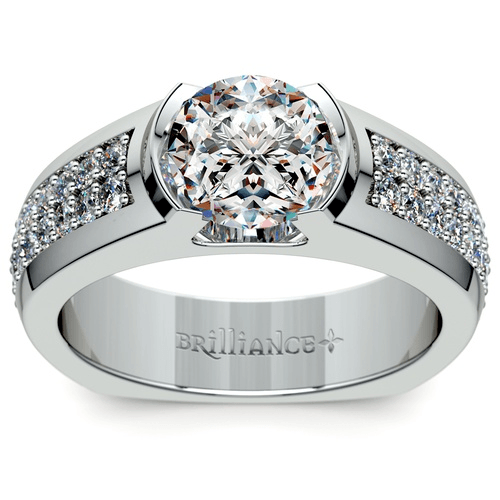 Check out our Top 10 Romantic Round Cut Diamond Engagement Rings.